DIE Martis, 8 die Augusti. Message from the H. C. about Martial Law at Sea;—for a Conference about Halliburton and Rolfe;—and with an Ordinance. Message to them, about repealing Gen. Skippon's Ordinance. and for an Allowance for Col. Maytton. Message from the H. C. with an Ordinance and Order. Pooley to attend about it. Officers imprisoned in Execution to be considered. Petition from the Common Council. Major Huntington sworn to his Narrative. 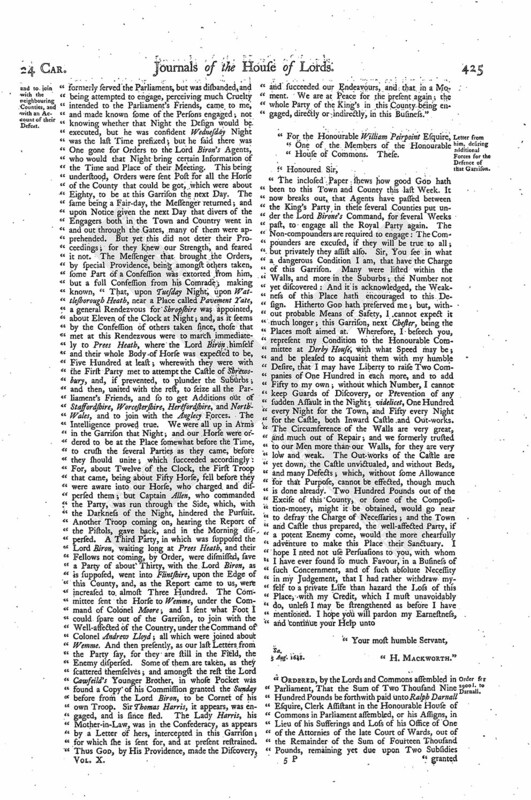 Paper from Col. Mackworth, Governor of Shrewsbury, about an Insurrection in Shropshire, under L. Byron, to seize that Town,and to join with the neighbouring Counties, and with an Account of their Defeat. Letter from him, desiring additional Forces for the Defence of that Garrison. Order for 2900 l. to Darnall. Letter from the P. of Wales, about the Treaty between the King and the Houses; desiring a Cessation during the Time it lasts;—and that Provision may be made for both Armies; and for the Fleet under his Command. Reduced Officers Petition, for a Personal Treaty with the King;— for the Accompts of Officers and Soldiers to be audited, and their Arrears paid —and for those imprisoned for Debt to be released. 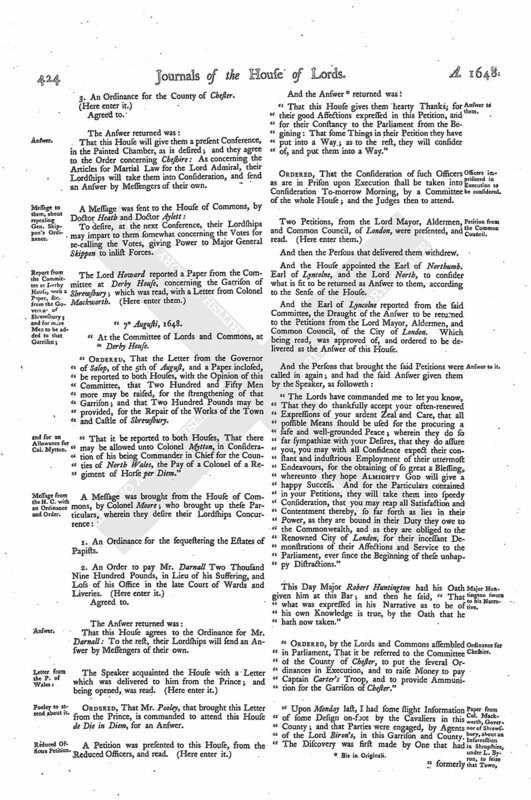 Petition from the Common Council, for a Personal Treaty with the King;—for a Cessation of Arms;—for Religion to be settled, the Army to be disbanded, &c.
Petition from the Common Council, concerning a Disturbance among the Commonalty of the Weavers Company, about the Election of their Officers. L. Viscount Say & Seale. Ds. Howard. 1. To put their Lordships in Mind of the Articles of Martial Law for the Lord Admiral. 2. To desire a Conference concerning Mr. Halliburton, and also concerning Major Rolph. 3. An Ordinance for the County of Chester. That this House will give them a present Conference, in the Painted Chamber, as is desired; and they agree to the Order concerning Cheshire: As concerning the Articles for Martial Law for the Lord Admiral, their Lordships will take them into Consideration, and send an Answer by Messengers of their own. To desire, at the next Conference, their Lordships may impart to them somewhat concerning the Votes for re-calling the Votes, giving Power to Major General Skippon to inlist Forces. "At the Committee of Lords and Commons, at Derby House. 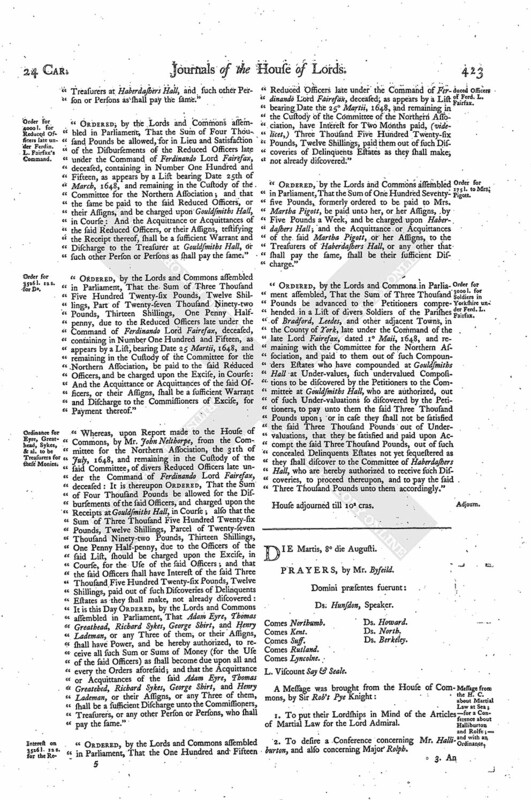 Ordered, That the Letter from the Governor of Salop, of the 5th of August, and a Paper inclosed, be reported to both Houses, with the Opinion of this Committee, that Two Hundred and Fifty Men more may be raised, for the strengthening of that Garrison; and that Two Hundred Pounds may be provided, for the Repair of the Works of the Town and Castle of Shrewsbury. "That it be reported to both Houses, That there may be allowed unto Colonel Mytton, in Consideration of his being Commander in Chief for the Counties of North Wales, the Pay of a Colonel of a Regiment of Horse per Diem." 1. An Ordinance for the sequestering the Estates of Papists. That this House agrees to the Ordinance for Mr. Darnall: To the rest, their Lordships will send an Answer by Messengers of their own. Ordered, That Mr. Pooley, that brought this Letter from the Prince, is commanded to attend this House de Die in Diem, for an Answer. "That this House gives them hearty Thanks, for their good Assections expressed in this Petition, and for their Constancy to the Parliament from the Begining: That some Things in their Petition they have put into a Way; as to the rest, they will consider of, and put them into a Way." Ordered, That the Consideration of such Officers as are in Prison upon Execution shall be taken into Consideration To-morrow Morning, by a Committee of the whole House; and the Judges then to attend. And then the Persons that delivered them withdrew. And the House appointed the Earl of Northumb. Earl of Lyncolne, and the Lord North, to consider what is fit to be returned as Answer to them, according to the Sense of the House. And the Earl of Lyncolne reported from the said Committee, the Draught of the Answer to be returned to the Petitions from the Lord Mayor, Aldermen, and Common Council, of the City of London. Which being read, was approved of, and ordered to be delivered as the Answer of this House. The Lords have commanded me to let you know, That they do thankfully accept your often-renewed Expressions of your ardent Zeal and Care, that all possible Means should be used for the procuring a safe and well-grounded Peace; wherein they do so far sympathize with your Desires, that they do assure you, you may with all Considence expect their constant and industrious Employment of their uttermost Endeavours, for the obtaining of so great a Blessing, whereunto they hope Almighty God will give a happy Success. And for the Particulars contained in your Petitions, they will take them into speedy Consideration, that you may reap all Satisfaction and Contentment thereby, so far forth as lies in their Power, as they are bound in their Duty they owe to the Commonwealth, and as they are obliged to the Renowned City of London, for their incessant Demonstrations of their Affections and Service to the Parliament, ever since the Beginning of these unhappy Distractions." This Day Major Robert Huntington had his Oath given him at this Bar; and then he said, "That what was expressed in his Narrative as to be of his own Knowledge is true, by the Oath that he hath now taken." "Ordered, by the Lords and Commons assembled in Parliament, That it be referred to the Committee of the County of Chester, to put the several Ordinances in Execution, and to raise Money to pay Captain Carter's Troop, and to provide Ammunition for the Garrison of Chester." "Upon Monday last, I had some slight Information of some Design on-foot by the Cavaliers in this County; and that Parties were engaged, by Agents of the Lord Biron's, in this Garrison and County. The Discovery was first made by One that had formerly served the Parliament, but was disbanded, and being attempted to engage, perceiving much Cruelty intended to the Parliament's Friends, came to me, and made known some of the Persons engaged; not knowing whether that Night the Design would be executed, but he was confident Wednesday Night was the last Time prefixed; but he said there was One gone for Orders to the Lord Biron's Agents, who would that Night bring certain Information of the Time and Place of their Meeting. This being understood, Orders were sent Post for all the Horse of the County that could be got, which were about Eighty, to be at this Garrison the next Day. The same being a Fair-day, the Messenger returned; and upon Notice given the next Day that divers of the Engagers both in the Town and Country went in and out through the Gates, many of them were apprehended. But yet this did not deter their Proceedings; for they knew our Strength, and feared it not. The Messenger that brought the Orders, by special Providence, being amongst others taken, some Part of a Confession was extorted from him, but a full Confession from his Comrade; making known, "That, upon Tuesday Night, upon Wattlesborough Heath, near a Place called Pavement Yate, a general Rendezvous for Shropshire was appointed, about Eleven of the Clock at Night; and, as it seems by the Confession of others taken since, those that met at this Rendezvous were to march immediately to Press Heath, where the Lord Biron himself and their whole Body of Horse was expected to be, Five Hundred at least; wherewith they were with the First Party met to attempt the Castle of Shrewsbury, and, if prevented, to plunder the Suburbs; and then, united with the rest, to seize all the Parliament's Friends, and so to get Additions out of Staffordshire, Worcestershire, Herefordshire, and NorthWales, and to join with the Anglecy Forces. The Intelligence proved true. We were all up in Arms in the Garrison that Night; and our Horse were ordered to be at the Place somewhat before the Time, to crush the several Parties as they came, before they should unite; which succeeded accordingly: For, about Twelve of the Clock, the First Troop that came, being about Fifty Horse, fell before they were aware into our Horse, who charged and dispersed them; but Captain Allen, who commanded the Party, was run through the Side, which, with the Darkness of the Night, hindered the Pursuit. Another Troop coming on, hearing the Report of the Pistols, gave back, and in the Morning dispersed. A Third Party, in which was supposed the Lord Biron, waiting long at Press Heath, and their Fellows not coming, by Order, were dismissed, save a Party of about Thirty, with the Lord Biron, as is supposed, went into Flintshire, upon the Edge of this County, and, as the Report came to us, were increased to almost Three Hundred. The Committee sent the Horse to Wemme, under the Command of Colonel Moore; and I sent what Foot I could spare out of the Garrison, to join with the Well-affected of the Country, under the Command of Colonel Andrew Lloyd; all which were joined about Wemme. And then presently, as our last Letters from the Party say, for they are still in the Field, the Enemy dispersed. Some of them are taken, as they scattered themselves; and amongst the rest the Lord Cawfeild's Younger Brother, in whose Pocket was found a Copy of his Commission granted the Sunday before from the Lord Biron, to be Cornet of his own Troop. Sir Thomas Harris, it appears, was engaged, and is since fled. The Lady Harris, his Mother-in-Law, was in the Confederacy, as appears by a Letter of hers, intercepted in this Garrison; for which she is sent for, and at present restrained. Thus God, by His Providence, made the Discovery, and succeeded our Endeavours, and that in a Moment. We are at Peace for the present again; the whole Party of the King's in this County being engaged, directly or indirectly, in this Business." For the Honourable William Peirpoint Esquire, One of the Members of the Honourable House of Commons. These. "Ordered, by the Lords and Commons assembled in Parliament, That the Sum of Two Thousand Nine Hundred Pounds be forthwith paid unto Ralph Darnall Esquire, Clerk Assistant in the Honourable House of Commons in Parliament assembled, or his Assigns, in Lieu of his Sufferings and Loss of his Office of One of the Attornies of the late Court of Wards, out of the Remainder of the Sum of Fourteen Thousand Pounds, remaining yet due upon Two Subsidies granted in or about May, 1641, for Supply of His Majesty's Army, and Relief of the (fn. 2) then Northern Parts of this Kingdom, uncollected, and in the Collectors Hands, concealed by the Treasurers or Collectors appointed to receive the same; and the Acquittance or Acquittances of the said Ralph Darnall, or his Assigns, testifying the Receipt thereof, shall be a sufficient Warrant and Discharge to the said Treasurers, and to the Chamberlain of London, and to the Receivers or Collectors, and to such other Person or Persons as shall pay the same." "To our Right Trusty and Right Well-beloved Cousin, the Speaker of the House of Peers for the Time being. "Right Trusty and Right Well-beloved Cousin, we greet you well. Understanding (with great Contentment) that the Two Houses of Parliament have resolved upon a Personal Treaty with His Majesty (One of the Particulars pressed by us in our Declaration of the 29th of July last, as most conducing to the Settlement of a blessed Peace); we have thought fit to acquaint you with our Sense and Desires concerning the same, to the End that they may be communicated by you to the House of Peers from us. "First, we propose, That the Treaty be appointed to be in such Place and in Manner as may best consist with the Honour, Freedom, and Safety of His Majesty, whereby the Agreement to be made may not be blemished with the Face of Restraint. "Secondly, That the Treaty may be betwixt His Majesty and His Two Kingdoms of England and Scotland, so as the Matters in Difference may equally fall under the Consideration of all Persons concerned therein. "Thirdly, That, during the said Treaty, there be a general Cessation of Arms, to the End that the Affections of the People, though engaged in several Parties, may thereby be prepared to meet in Amity and brotherly Kindness; and that no intervening Accidents or Successes may disturb the Proceedings in this Treaty. "Lastly, That an orderly moderate Subsistence, during the Treaty, may be agreed upon for all Armies and Forces now on-foot, and particularly for the Scottish Army, in such Manner as may be with the least Pressure on the Northern Counties. "And if the Two Houses shall think fit to consent unto the Effect of what we now propound, as proper to render this Treaty effectual, we shall with great Joy and Alacrity interpose our Mediation to the King our Father, for the obtaining of all such Concessions and Acts of Grace as, by the Blessing of God, may most conduce to a firm and lasting Peace, and the Happiness of His Majesty and all His People. "We farther desire you to propound to the House of Peers, That some equal Course may be speedily settled, for the Support of us and the Navy with us, whereby we may be enabled to protect the Trade of the Kingdom, and may forthwith discharge all Ships and Merchandizes now stayed by us. "Given under our Hand and Seal, from aboard the Fleet in The Downes, the 5th Day of August, in the 24th Year of the Reign of the King our Royal Father." "1. 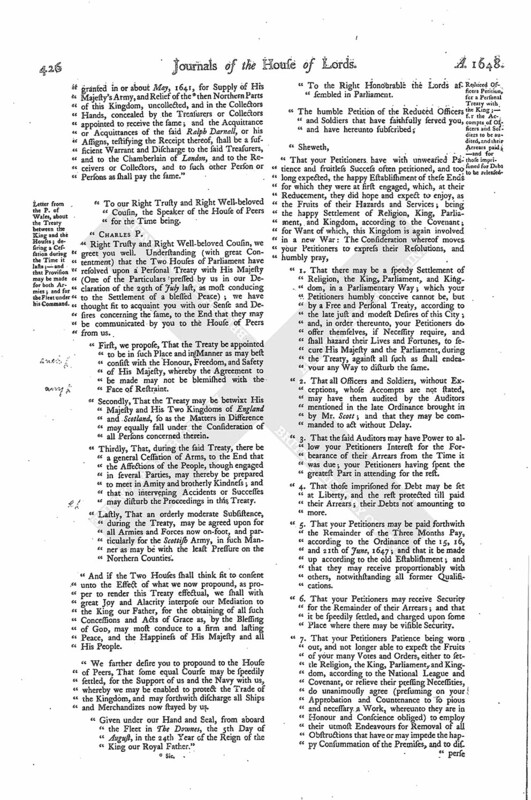 That there may be a speedy Settlement of Religion, the King, Parliament, and Kingdom, in a Parliamentary Way; which your Petitioners humbly conceive cannot be, but by a Free and Personal Treaty, according to the late just and modest Desires of this City; and, in order thereunto, your Petitioners do offer themselves, if Necessity require, and shall hazard their Lives and Fortunes, to secure His Majesty and the Parliament, during the Treaty, against all such as shall endeavour any Way to disturb the same. 2. That all Officers and Soldiers, without Exceptions, whose Accompts are not stated, may have them audited by the Auditors mentioned in the late Ordinance brought in by Mr. Scott; and that they may be commanded to act without Delay. 3. That the said Auditors may have Power to allow your Petitioners Interest for the Forbearance of their Arrears from the Time it was due; your Petitioners having spent the greatest Part in attending for the rest. 4. That those imprisoned for Debt may be set at Liberty, and the rest protected till paid their Arrears; their Debts not amounting to more. 5. That your Petitioners may be paid forthwith the Remainder of the Three Months Pay, according to the Ordinance of the 15, 16, and 21th of June, 1647; and that it be made up according to the old Establishment; and that they may receive proportionably with others, notwithstanding all former Qualifications. 6. That your Petitioners may receive Security for the Remainder of their Arrears; and that it be speedily settled, and charged upon some Place where there may be visible Security. 7. That your Petitioners Patience being worn out, and not longer able to expect the Fruits of your many Votes and Orders, either to settle Religion, the King, Parliament, and Kingdom, according to the National League and Covenant, or relieve their pressing Necessities, do unanimously agree (presuming on your Approbation and Countenance to so pious and necessary a Work, whereunto they are in Honour and Conscience obliged) to employ their utmost Endeavours for Removal of all Obstructions that have or may impede the happy Consummation of the Premises, and to dis perse such Jealousies as has been unjustly thrown upon them. They assure your Honours, not any more to engage, but for those Ends." "To the Right Honourable the Lords in Parliament assembled. "The humble Petition of the Lord Mayor, Aldermen, and Commons, of the City of London, in Common Council assembled. 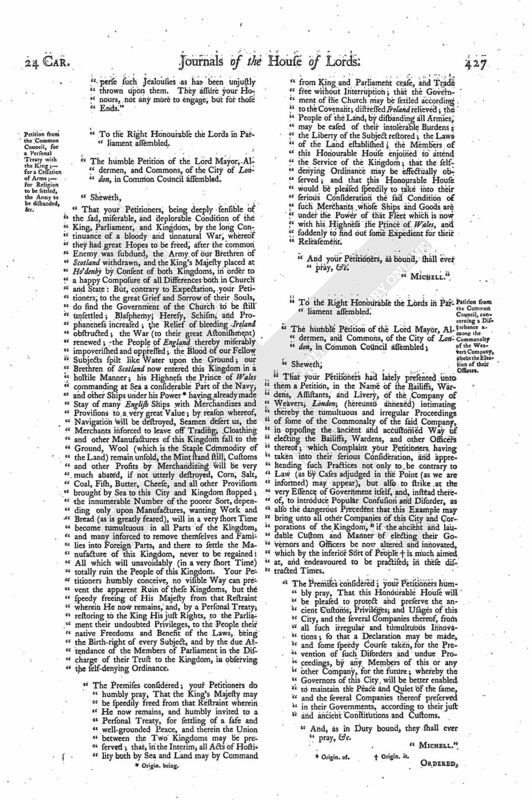 "That your Petitioners, being deeply sensible of the sad, miserable, and deplorable Condition of the King, Parliament, and Kingdom, by the long Continuance of a bloody and unnatural War, whereof they had great Hopes to be freed, after the common Enemy was subdued, the Army of our Brethren of Scotland withdrawn, and the King's Majesty placed at Ho'denby by Consent of both Kingdoms, in order to a happy Composure of all Differences both in Church and State: But, contrary to Expectation, your Petitioners, to the great Grief and Sorrow of their Souls, do find the Government of the Church to be still unsettled; Blasphemy, Heresy, Schism, and Prophaneness increased; the Relief of bleeding Ireland obstructed; the War (to their great Astonishment) renewed; the People of England thereby miserably impoverished and oppressed; the Blood of our Fellow Subjects spilt like Water upon the Ground; our Brethren of Scotland now entered this Kingdom in a hostile Manner; his Highness the Prince of Wales commanding at Sea a considerable Part of the Navy, and other Ships under his Power (fn. 3) having already made Stay of many English Ships with Merchandizes and Provisions to a very great Value; by reason whereof, Navigation will be destroyed, Seamen desert us, the Merchants inforced to leave off Trading, Cloathing and other Manufactures of this Kingdom fall to the Ground, Wool (which is the Staple Commodity of the Land) remain unfold, the Mint stand still, Customs and other Profits by Merchandizing will be very much abated, if not utterly destroyed, Corn, Salt, Coal, Fish, Butter, Cheese, and all other Provisions brought by Sea to this City and Kingdom stopped; the innumerable Number of the poorer Sort, depending only upon Manufactures, wanting Work and Bread (as is greatly feared), will in a very short Time become tumultuous in all Parts of the Kingdom, and many inforced to remove themselves and Families into Foreign Parts, and there to settle the Manufacture of this Kingdom, never to be regained: All which will unavoidably (in a very short Time) totally ruin the People of this Kingdom. Your Petitioners humbly conceive, no visible Way can prevent the apparent Ruin of these Kingdoms, but the speedy freeing of His Majesty from that Restraint wherein He now remains, and, by a Personal Treaty, restoring to the King His just Rights, to the Parliament their undoubted Privileges, to the People their native Freedoms and Benefit of the Laws, being the Birth-right of every Subject, and by the due Attendance of the Members of Parliament in the Discharge of their Trust to the Kingdom, in observing the self-denying Ordinance. "The Premises considered; your Petitioners do humbly pray, That the King's Majesty may be speedily freed from that Restraint wherein He now remains, and humbly invited to a Personal Treaty, for settling of a safe and well-grounded Peace, and therein the Union between the Two Kingdoms may be preserved; that, in the Interim, all Acts of Hostility both by Sea and Land may by Command from King and Parliament cease, and Trade free without Interruption; that the Government of the Church may be settled according to the Covenant; distressed Ireland relieved; the People of the Land, by disbanding all Armies, may be eased of their intolerable Burdens; the Liberty of the Subject restored; the Laws of the Land established; the Members of this Honourable House enjoined to attend the Service of the Kingdom; that the selfdenying Ordinance may be effectually observed; and that this Honourable House would be pleased speedily to take into their serious Consideration the sad Condition of such Merchants whose Ships and Goods are under the Power of that Fleet which is now with his Highness the Prince of Wales, and suddenly to find out some Expedient for their Releasement. 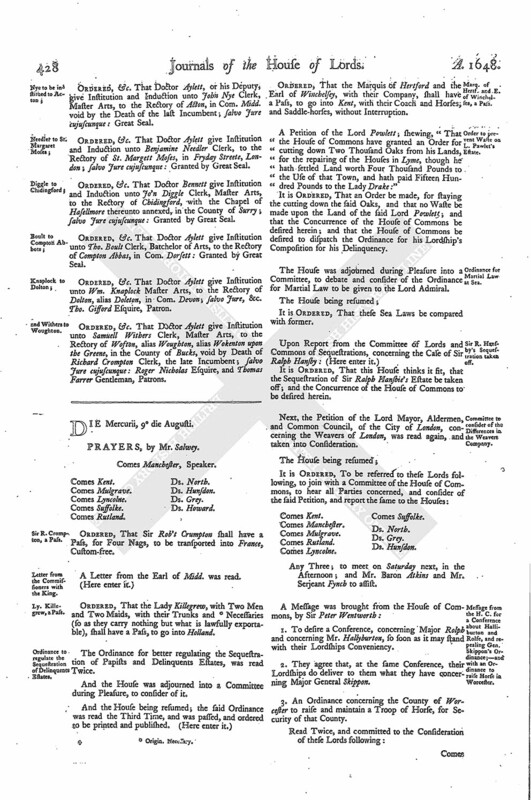 "And your Petitioners, as bound, shall ever pray, &c.
"That your Petitioners had lately presented unto them a Petition, in the Name of the Bailiffs, Wardens, Assistants, and Livery, of the Company of Weavers, London, (hereunto annexed) intimating thereby the tumultuous and irregular Proceedings of some of the Commonalty of the said Company, in opposing the ancient and accustomed Way of electing the Bailiffs, Wardens, and other Officers thereof; which Complaint your Petitioners having taken into their serious Consideration, and apprehending such Practices not only to be contrary to Law (as by Cases adjudged in the Point (as we are informed) may appear), but also to strike at the very Essence of Government itself, and, instead thereof, to introduce Popular Confusion and Disorder, as also the dangerous Precedent that this Example may bring unto all other Companies of this City and Corporations of the Kingdom, (fn. 4) if the ancient and laudable Custom and Manner of electing their Governors and Officers be now altered and innovated, which by the inferior Sort of People (fn. 5) is much aimed at, and endeavoured to be practised; in these distracted Times. "The Premises considered; your Petitioners humbly pray, That this Honourable House will be pleased to protect and preserve the ancient Customs, Privileges; and Usages of this City, and the several Companies thereof, from all such irregular and tumultuous Innovations; so that a Declaration may be made, and some speedy Course taken, for the Prevention of such Disorders and undue Proceedings, by any Members of this or any other Company, for the future; whereby the Governors of this City will be better enabled to maintain the Peace and Quiet of the same, and the several Companies thereof preserved in their Governments, according to their just and ancient Constitutions and Customs. "And, as in Duty bound, they shall ever pray, &c.
Ordered, &c. That Doctor Aylett, or his Deputy, give Institution and Induction unto John Nye Clerk, Master Arts, to the Rectory of Acton, in Com. Midd. void by the Death of the last Incumbent; salvo Jure cujuscunque: Great Seal. Ordered, &c. That Doctor Aylett give Institution and Induction unto Benjamine Needler Clerk, to the Rectory of St. Margett Moses, in Fryday Streete, London; salvo Jure cujuscunque: Granted by Great Seal. Ordered, &c. That Doctor Bennett give Institution and Induction unto Jo'n Diggle Clerk, Master Arts, to the Rectory of Chidingford, with the Chapel of Hasellmore thereunto annexed, in the County of Surry; salvo Jure cujuscunque: Granted by Great Seal. Ordered, &c. That Doctor Aylett give Institution unto Tho. Boult Clerk, Batchelor of Arts, to the Rectory of Compton Abbas, in Com. Dorsett: Granted by Great Seal. Ordered, &c. That Doctor Aylett give Institution unto Wm. Knaplock Master Arts, to the Rectory of Dolton, alias Doleton, in Com. Devon; salvo Jure, &c. Tho. Gifford Esquire, Patron. Ordered, &c. That Doctor Aylett give Institution unto Samuell Withers Clerk, Master Arts, to the Rectory of Woston, alias Woughton, alias Wokenton upon the Greene, in the County of Bucks, void by Death of Richard Crompton Clerk, the late Incumbent; salvo Jure cujuscunque: Roger Nicholas Esquire, and Thomas Farrer Gentleman, Patrons.